One of the most frequent questions I get asked is "how do you afford to travel so much?" Although I have been on a travel hiatus for personal reasons in the last year, I have not kicked the travel bug (and never will). Traveling DOESN'T have to be expensive! With careful planning and a bit of research, you can save a lot of money. 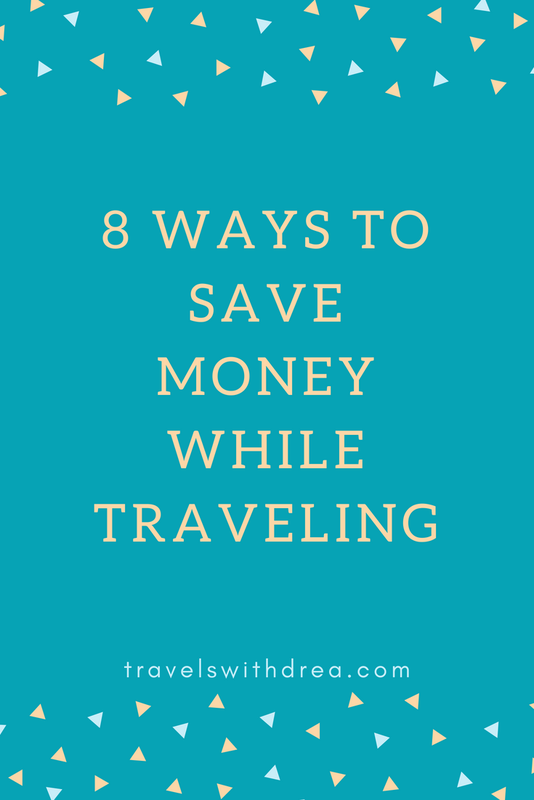 Here are my top 8 tips for saving money while on vacation. I can't stress this enough. Of course restaurants are going to take advantage of you in the most touristy spots and charge you way more than you should pay. Walk a couple blocks away from the tourist spots or do research to see where locals eat. Speaking from personal experience, the food and service in tourist hot spots is usually of poor quality. When we were in Barcelona, my husband and I bought our breakfast and daily snacks at a grocery store near by. We saved so much money! We did the same when visiting Japan, South Korea, and Austria. There is no need to spend all of your money on food. You will also find all sorts of cool products you have never seen before and can try out more for less at a grocery store. A lot of cities I have visited had reliable and affordable public transportation. In Los Angeles I took a bus from LAX to Santa Monica for $1! It took an hour but I got to see different parts of LA, and didn't have to spend a fortune on a taxi. Added bonus, there was free Wi-Fi! Do your research though, in some cities it might be sketchy to take public transit, especially at night. When we were in Barcelona, Milan and Vienna, we stayed in hotels that were on the subway line, but away from the tourist attractions. We saved so much by just being a couple of stops away from the city centers. A lot of people think that staying in a hostel is the only place to stay when on budget. 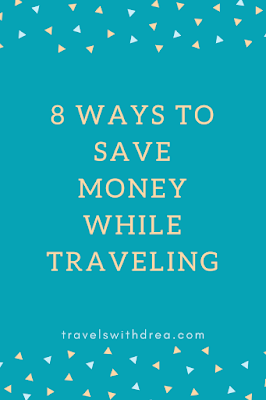 This may be true for solo travelers, but traveling with at least one other person could help you lower the cost when getting a hotel room or AirBnB when the cost is split. A lot of hostels charge per person, so take a look at how much a hotel would cost. If the same, go with a hotel and get some proper sleep. Not only is this friendly for your wallet, but the environment too. Always check to see if the local tap water is safe to drink, if so, fill up and save lots of money. In countries where bottled water is a must, buy large bottles and fill up your own. You will save a lot! Tipping isn't always necessary. In a lot of countries it isn't the norm. In some, like South Korea, it is considered offensive. Check to see if tipping is common before you go, and don't feel obligated to tip if you had terrible customer service. This might sound expensive, but it really isn't. If something were to go horribly wrong while you are on vacation, the last thing you need to worry about is how you will pay for your medical bills. This can be especially expensive in countries like the US (I would never step foot there without it). Do you have any money saving tips to share? Leave them in the comments below. There is a popular quote that goes something along the lines of "Paris is always a good idea" and that same quote can be said for Cuba. I adore Cuba! From the beaches, to the people, to the culture, Cuba has something for everyone. 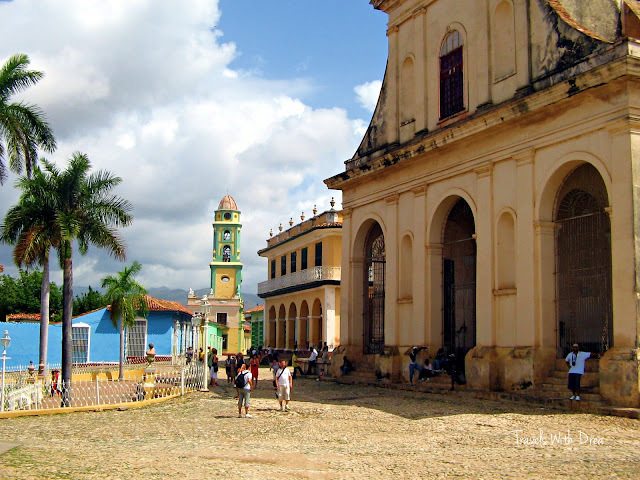 Having been to Cuba four times, at different times of the year, I have decided to share my preference for when to visit. The first time I went was in 2003, just days after the big blackout in parts of Canada and the United States (who remembers that?). I went in the month of August, and despite this being the start of hurricane season, it didn't rain as much as I thought it would. Correction. It rained every day, but it was usually in the late afternoon/early evening when we were getting ready to leave the beach and get ready for dinner. Funny thing about rain is that as soon as it starts, majority of people run for their rooms. I have experienced this on several occasions. This becomes the best time to go for a swim in the pool (as long as there isn't thunder and lightning of course), as you will usually have the pool to yourself. You are wet anyway so why let a little rain stop you from having some fun? Aside from the rain, this time of year is very hot and humid. And filled with mosquitoes. Now if you are a mosquito magnet like me, you will want to pack your bug spray (or bring me along and I will attract them all to me). If you are looking to go to Cuba just to lounge by the pool or suntan at the beach, and don't mind the heat and some rain, then this would be an ideal time to go. Plus, this time of year is usually cheaper than the other months. But if you are looking to explore and do some sightseeing, or spending lots of time outdoors, I wouldn't recommend it. It is just too hot. Like sweaty-body-parts-that-you-didn't-know-could-get-sweaty kind of hot. The second and third time I went was in May. This is a moderate time of year in terms of price. It is the start of rainy season, but both times I went we might have seen rain one day, again in the late afternoon/early evening. It is warm this time of year as well. Very warm. On both trips I ended up doing day trips into the nearby cities. Both times I was so hot I wished I brought more water. If you do decide to be outside during this time of year, bring sunscreen, a hat, and LOTS of water. This is also a time of year that is not too busy at the resorts so you won't have to worry about not finding a decent spot at the beach. It is also moderately priced. The best time to visit in my opinion is during the winter months. Why? 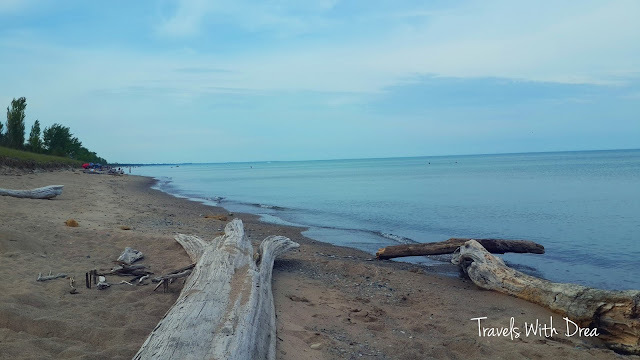 Well I live in Southern Ontario which gets high temperatures during the summer months as it is (above 30C even), and has lots of beautiful beaches of it's own (see my post here). To me, it doesn't make sense to take time off for the beach when there are beaches to go to near by. BUT, if you are not as blessed as we are here with the nearby beaches, then that may be a different story. Winter months, on the other hand, are long and cold. I went in January and absolutely loved it, for a number of reasons. 1. It was still warm, but not nearly as hot as in May or August. 2. It gave me a break from the cold Canadian winter. 3. It is more lively at the resorts. Winter months are the more expensive months, especially around the Christmas and New Year's holidays, but in my opinion, so worth it for that winter break. It is also a lot busier, which has pros and cons, but the definite pro is the lively atmosphere everywhere you go. If you are not a people person and don't like crowds, perhaps another season would be better for you. 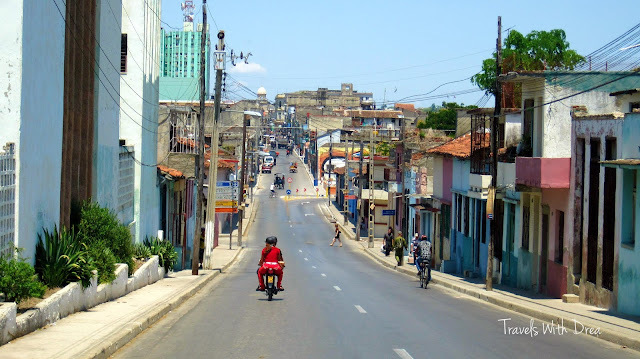 If you've been to Cuba, I want to hear from you! What is your favourite time of year to go and why? Let me know in the comments below! Toronto is a beautiful and fun city to visit, but it can get expensive pretty fast. This doesn't mean that you have to break the bank to come for a visit, it just means you have to be a bit more budget conscious. 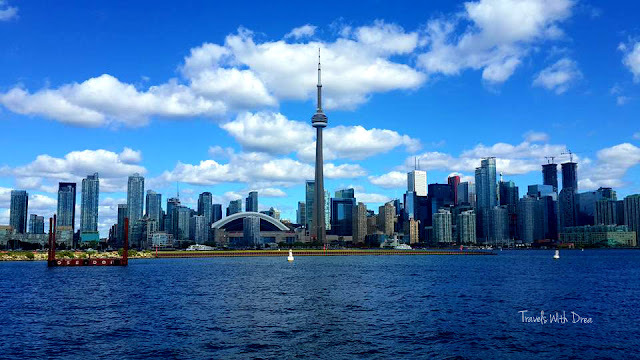 Here are my tips for ways to save money while visiting Toronto. Try to find a hotel or AirBnB close to the subway line. Not only will you save money by not taking taxis everywhere, you will also save time not being stuck in traffic which can get ugly pretty fast. If you plan on spending most of your time downtown, I would recommend staying downtown. It will save you a lot of time. Parking rates vary across the city, especially during popular events and different days of the week. 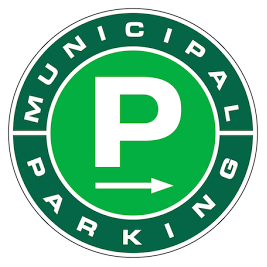 Hotels often charge way more than the Green P Parking lots that can be found across the city. Use the Green P Parking website to figure out what is the cheapest parking to where you are going. If you are staying in a neighbourhood that has free street parking, take advantage of it but be sure to read street signs as overnight parking may require a permit. Your best option, and if you can do it, is to take public transportation. Having a car downtown Toronto is more of a pain than luxury. The Toronto Transit Commission (TTC) has a terrible reputation for being unreliable. There are often route changes or delays because of events, weather, maintenance, or construction. But it still is your cheapest way around the city. Get the Presto card for additional savings especially if you plan to use the GO Transit system to leave the downtown core. Check out the TTC Trip Planner to plan out your route. 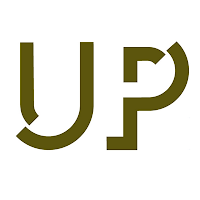 The cheapest, and possibly the fastest way to get from Pearson International Airport to downtown Toronto would be using the UP Express. Taxis and Uber can be quite expensive depending on your destination. Of course, if your hotel offers a free shuttle service, take advantage of it...you can't beat free! Eating away from the main tourist attractions will be friendly on your pocket. One of my favourite areas to eat delicious food is in Koreatown, but there are many neighbourhoods around the city that cater towards the locals. Chain restaurants are usually more expensive than family or privately owned ones. Not to mention, you can find food from anywhere in the world in the heart of Toronto at affordable prices. Entrance fees to attractions can add up quickly, fast! Be sure to read TripAdvisor's Toronto Forum to see what people recommend and if it is something that is of interest to you. Also, some museums and galleries might have discount days or offer discounts to students and seniors, so do your research to make sure you get the best deal possible. There is also the Toronto City Pass which can save you money if you plan it out right. Some of the best deals for shopping will be away from tourist hot spots, such as the Eaton Center. If you have a car and don't mind driving out of the downtown, Dixie Outlet Mall and Vaughan Mills Mall. In the city, check out Kensington Market or Chinatown for some great finds. There are also many free events and things to see and do in Toronto. If you budget accordingly, you will be able to plan a budget friendly vacation. If you have questions, or would like additional information, please leave them in the comments below. I haven't shared a guest post in a while for a number of reasons, primarily because I am hesitant on who to have featured. But my guest today is someone I know personally, and who I had the pleasure of embarking on my first international teaching adventure with in the summer of 2014. Ben is a 30-year-old primary school teacher from Nottinghamshire, England. He has traveled four continents over the past decade, and he confirms his Britishness through his love for Cricket and cups of tea. Ben embarked on a journey he will never forget during his summer holidays last year. Read on to find out why his trip to Southeast Asia was a special one. After breaking-up for the summer holidays on the Friday, there was some rush to have everything ready for a month away for a Tuesday flight. The preceding days included mad dashes to the shops, the packing and re-packing of bags, quick goodbye visits and even tears. A two-stop flight included Heathrow, Helsinki, Singapore and finally KLIA. Having been to 'KL' before, I knew what to expect - a European style maze of concrete that belies its geographical location. The city itself offers a range of potential skyline views and a decent hop-on, hop-off bus service, but it lacks that feel of real Asia that can be so addictive. A highlight was definitely a trip to Opium, a fabulous Malaysian restaurant offering an irresistible beef rendang on its menu. The final hours in KL epitomised the idea of faux-westernism. The nightmare that is the TBS bus terminal finally allowed us a way out and we headed to the idyllic Perhentian Islands. 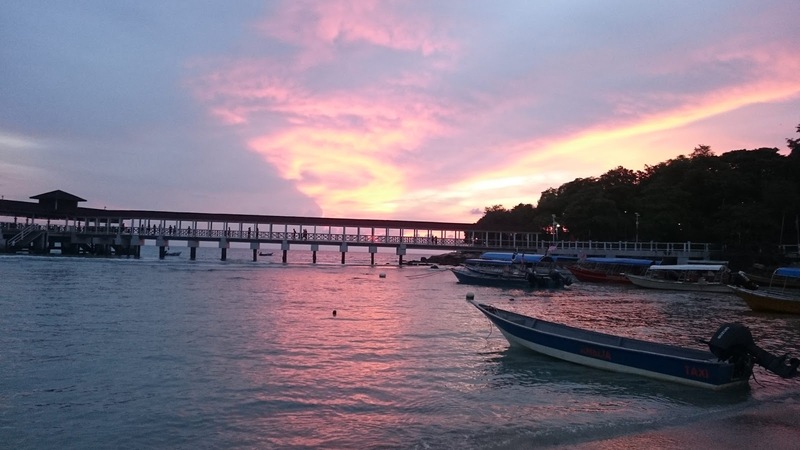 The Perhentian Islands offered the perfect place to chill-out after leaving the city. Located on Malaysia's east coast, the two islands have minimal electricity, internet and rooms, but as long as you find the last one, the other two pale into insignificance. Kecil is the smaller of the two islands, but busier. Of the two main beaches, Coral and Long, Long certainly has the edge. Pristine white sand with azure water, that allows you to observe your own toes, offers the perfect place for some R&R, as long as you can cope with limited options for sunbathing. Four days of soaking up the rays prepared us for a change of pace and we headed to the mountainous central region of the diverse country. 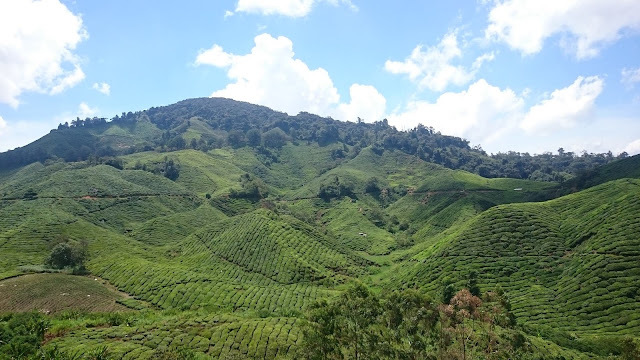 The Cameron Highlands are situated in the center of Malaysia and offer a stark alternative to the coastal options. The temperatures in August drops from nearly 100F by the coast to a pleasant 75F in the Highlands. The Highlands are famous for British tea plantations and fruit farms - particularly strawberries, where you are invited to pick your own. We stayed in the town of Tanah Rata, which provided an excellent location for the region. Day trips, bars and restaurants are available and the area is a real highlight of the country. A quick overnight stay back in KL allowed for another Opium rendang, before an early morning flight to Hanoi. Hanoi is truly Asia. The sounds, the smells, the sheer volume of both vehicle and human traffic - they're all overwhelming to the senses. It doesn't have the sights of Bangkok, or the charm that can be captured by smaller cities in the region, but it has got something. The things that people search for in southeast Asian cities are all there - the street food, the markets, the temples and the nightlife. It really is a 24-hour city. I didn't fall in love with Hanoi however. Three days was enough and my fiancee (see later) was glad to get out of there. It was simply too much. The six lanes of traffic, the searing heat reflecting from masses of concrete, the lack of an obvious escape. The Vietnam War museum was interesting and was also a nice change of atmosphere, but do beware of the bias. I very much doubt that it was an American holiday camp. 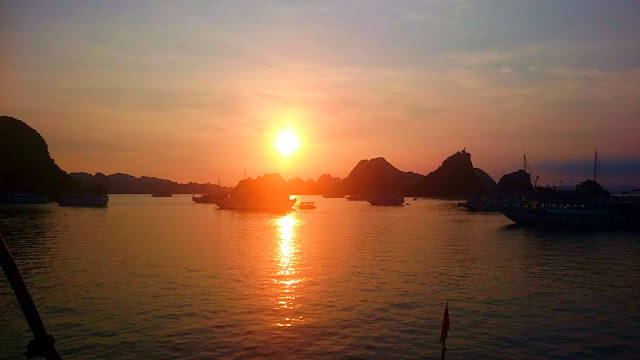 A four-hour bus journey took us from Hanoi to Ha Long and to an organized boat trip through the infamous bay. These tours are sold everywhere in Hanoi and range in prices depending on the luxury of the boat you choose. We paid for a mid-range (most companies offer 3 to 4 different levels of hospitality) but it wasn't as amazing as we'd hoped. A 24-hour tour was incredibly rushed. There was little time for relaxing or taking in the outstanding natural views. 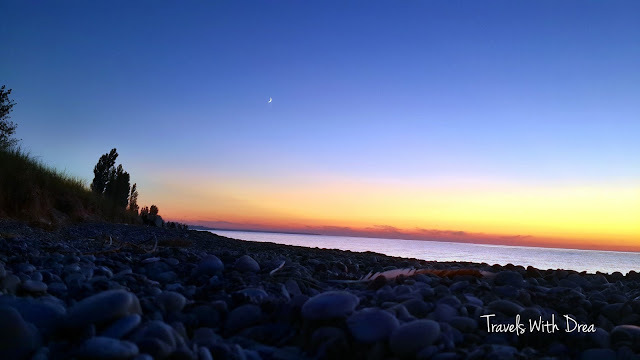 The trips offer cave visits, sea kayaking, beach stops, cookery classes - the list goes on. 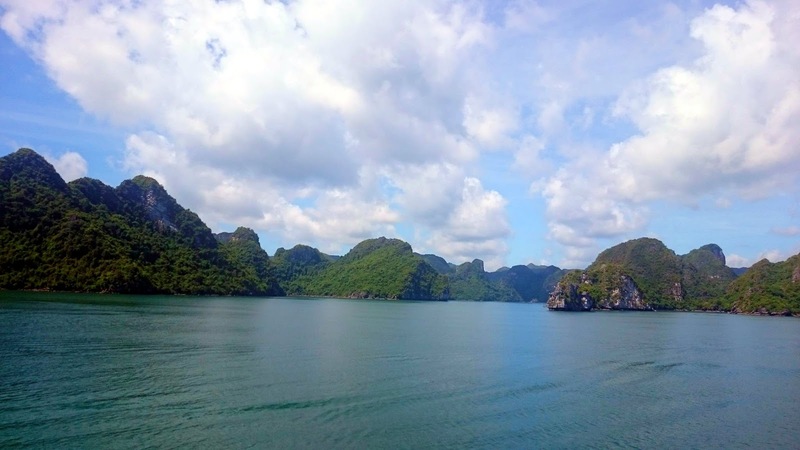 I advise working out exactly what you want to get out of a trip to Ha Long before you book. Drinking cocktails at sunset was the highlight and made the whole experience worthwhile, even if we still left a little underwhelmed. An overnight sleeper took us from Ha Long to the historic city of Hue - a really pretty city that had pleasant, if not remarkable, night markets and a breath-taking imperial city complex. Allow a good half a day to take the entire imperial city in. The food in Hue was tasty, with a local delicacy of minced pork on lemongrass lollypops, a favourite, which is eaten with a Vietnamese style satay dip. Our final stop in Vietnam was a very chilled out five days in the central coastal city of Hoi An. There is a lot of accommodation by the coast around fifteen minutes from the city and An Bang beach is particularly popular. It offers a lengthy stretch of golden sand with clear seas. 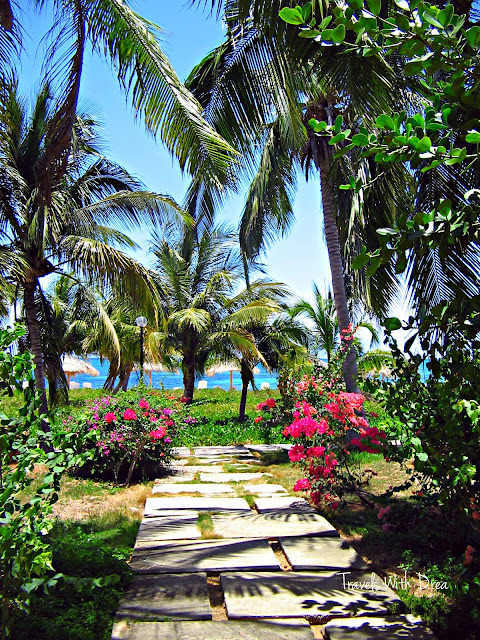 It lacks the obvious beauty of the white sand/azure sea combination, but was a perfect place to relax and sunbathe. Our final day in Hoi An was a day of extreme luck. We just so happened to be there for the monthly lantern festival, which was a jumble of colour and incense, painted upon the backdrop of picturesque trading houses and traditional dwellings. It is an experience not to be missed. We only had time for one stop in Cambodia and Siem Reap was an easy choice. The opportunity to visit Angkor Wat and the surrounding temples and complexes was one I couldn't turn down. Siem Reap has so much more however. Yes it has become a little overrun by tourism in places and the prices are more than you would expect to pay in the region, yet its charm is undeniable. Markets seem to sell the same things, but despite this they compel you to continue browsing. The river is a miserable clay-brown, but is well worth a walk alongside. The main tourist center has been tailored to a western audience, but you still have a desire to turn every corner. The temples are extraordinary as you might expect, the number of visitors is of course astronomical, but the local authorities do make attempts to cap numbers per day, which ensures the beauty is still held. 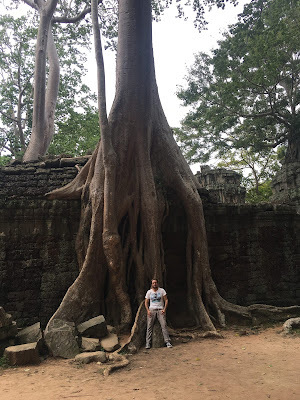 After Angkor Wat, Angkor Thom is the biggest draw for visitors, but I recommend Ta Prohm. Ta Prohm catapults you into adventure as it stirs up memories of the Tomb Raider series, with extravagant roots gripping the temple's walls in a magical fist. The imagination can lead you to believe you are one ill-judged step away from plummeting through a hidden hatch beneath your feet and into a secret vault. I wasn't, and I'm still a little bit disappointed about this. Never mind. The last leg of our summer adventure was another short flight away to the former British overseas territory of Hong Kong. Now, I have never been to China before, so I can't really make this comparison, but it just doesn't feel like China. It has a certain 'Singapore' quality to it. English street signs, hardly anybody who cannot speak English and of course a very modern and western feel. Those of you who are lucky enough to have lost a month's salary during a few days in Singapore may now understand what I mean by the comparison. Vast shopping malls contain designer shops such as Prada and Versace, seven-elevens sit on every corner and you are never more than five minutes away from the next air-conditioned bus. Personally, I am thankful for the copious amounts of jewelers Hong Kong is famous for - it's all about the diamonds - as I came to Hong Kong with the purpose of acquiring a ring. 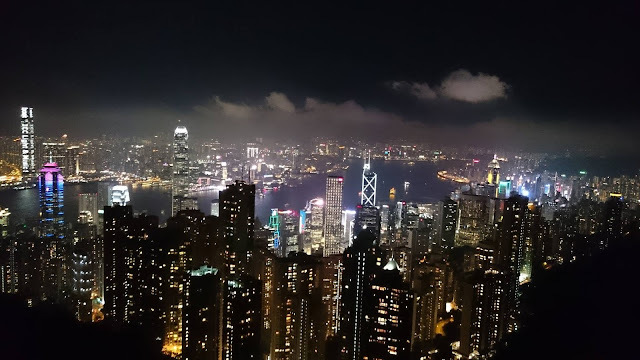 On top of Victoria Peak (named after Britain's famous monarch herself) and in the presence of the awe-inspiring views of Hong Kong Island and Kowloon beyond it, she said 'yes' and as they say, the rest is history. Hong Kong will now forever be special to us, but it could be for any visitor. The parks are clean and ornate, the skyscrapers are imperious and the night skyline is a thing of wonder. In one simple word - go. Another 20 hours' worth of traveling completed and we were home, thankful for the opportunity - it was a truly fantastic month. Thank you, Ben, for your contribution and all the best in your next adventure of the married life! As some of you may know, my husband and I are expecting a baby in late July. It is an exciting time for us as we get ready to welcome our bundle of joy this summer. As first-time parents, there are many things we have yet to learn about, but we are both the type of people who try not to overwhelm ourselves and learn as we go. One of the things I have taken the task to learn recently was traveling while pregnant. As it is evidently obvious, I love to travel, but as much as I love to travel, I hate flying. I am a nervous flyer. I prefer to have my two feet on the ground than soaring above the clouds. But don't get me wrong, I will still get on a plane and go where I need to go, I just won't enjoy it. Since I know I am a nervous flyer, I have decided not to fly during pregnancy. Although it is perfectly safe (depending on your pregnancy and stage in pregnancy, of course), I know that I will just cause unnecessary stress to the baby and make myself more uncomfortable than need be. As a result, we have decided to go on a mini babymoon to Philadelphia for the Easter long weekend, and we will be traveling by car. We have done some local traveling during my pregnancy, but this will be the first time we are going to be traveling for more than 2 hours. 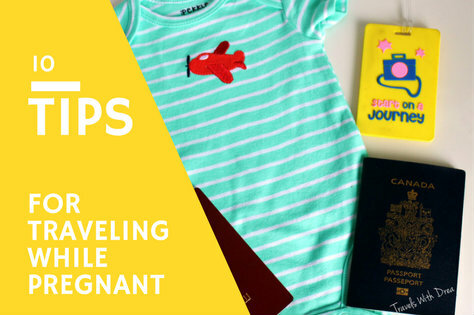 So here are my tips for when you decide to travel while pregnant (as always, please consult your doctor before traveling and be sure to do additional research as I am not an expert on the topic, just providing some tips that I found useful). If you are generally a healthy person, odds are that you normally don't consult your doctor about your travel plans. But during pregnancy, you should talk to them. Your doctor will be able to provide you with advice that is unique to your pregnancy, and other health related tips to keep in mind while you are away. If they advise you not to travel it is likely with good reason, so be sure to take their advice. I have said it before, and I will say it again: if you can't afford travel insurance then you can't afford to travel. If something happens while you are abroad, and you don't have travel insurance, you will be expected to pay out of pocket. If you are a Canadian citizen like me, and are traveling to the United States, you best be arriving with travel insurance. If you do get travel insurance (which you really should), check what it covers. If you have a high-risk pregnancy, and if something happens, odds are your insurance company will not cover your medical costs. If you have a risk-free pregnancy, and an emergency occurs, odds are you will be covered by the insurance. But to be safe, it is best to call and ask, better yet get the information in writing. One of the benefits of being pregnant is being able to wear maternity clothing, which is oh so comfortable (I think I might extend the life of mine postpartum for those bloated days I tend to get). If you have not yet invested in some comfortable maternity clothes, this is a great time to do so. Maternity clothes can be pricey, but if you stick to the sales racks or cheaper stores like Old Navy, you are likely to save some money. In addition to clothing, have comfortable shoes. Pregnant or not, you should always have a comfortable pair of walking shoes for sightseeing. Just remember that this is not the time to wear your new shoes in. Odds are you will get blisters and not be able to enjoy your vacation as much. Sure you want to look great for the photos, but if your feet and body ache because of uncomfortable shoes, it will show through on your photos whether you like it or not. If you are pregnant, you don't need me telling you how thirsty you get. Regardless of your means of transportation, be sure to stay hydrated, and especially while flying. While in the air, you are likely to become dehydrated so be sure to drink lots of water. If you know that your airline will charge you for drinks, do yourself a favour and buy a bottle of water at the duty free before you board. Eating healthy food can be difficult while traveling, but it doesn't have to be. I personally don't believe that you have to eat at a restaurant for every single meal. While traveling, I like to find local grocery stores close to the hotel where I can purchase some fruits and veggies and eat them as I go. You can wash them in your hotel room, and some even come pre-cut for you so that takes the hassle off. Eating healthy while pregnant is important, so be sure that while you are on vacation, you are not also taking a vacation from your pregnancy. Pregnancy can do funny things with your bladder and bowel movements, and there is no exception to the rule when traveling. If you have to go then go as soon as possible. Holding in can cause a UTI or constipation, and nobody has time for that while on vacation! If you are traveling by plane or train, get up and use the bathroom as needed. If you are traveling by car, keep track of the signs that indicate where the next rest stop is. If you are going to travel by bus, it is a good idea to find out beforehand if there will be a washroom on board, otherwise, you might get stuck holding it in longer than you want to. While pregnant, you are at a higher risk of blood clots. As a result, you want to be stretching and moving as often as possible (I have read at least once an hour). Blood clots are not fun ever, let alone when you are pregnant. While traveling, be sure to get up and stretch your legs as often as possible. If you are taking any medications, vitamins or regular, don't forget to bring them along. If you are traveling to a country where you don't know the language, it is a good idea to talk to your doctor or pharmacist before leaving to find out what you can take with you in case something happens. There are many medications you can't take while pregnant, so plan ahead. Yup, I said it! One thing I would not recommend is traveling to the Caribbean. In fact, I would not recommend traveling anywhere that you can easily get a virus, infection, or disease. Even if you are planning to get pregnant in the next year, I would avoid this area as many reports have indicated that the Zika virus can live in men and women longer than previously believed. Whether you want to think that the Zika virus is just a government conspiracy or not, it is not something you should risk finding out about. The Caribbean will be there once you deliver so just wait it out. Pregnancy is not a time to go all out on exploring a new city or country in a short period of time. What you might normally be able to do might not be physically possible depending on how far along you are and how your pregnancy is progressing. Our bodies do funny things to us while we are pregnant so be sure to take breaks and rest periods. I know that I personally get winded a lot faster and keeping up with my husband often results in me asking him to slow down (even with my long legs, I can't keep up with him most of the time). Your trip will be much more enjoyable, and you will be able to see a lot more if you take a moment to catch your breath and enjoy the view. If you do decide to travel while pregnant, that is perfectly fine as long as you are experiencing a healthy pregnancy and you have received your doctor's approval. I have yet to travel to Philadelphia so I will let you all know how that went, but I have a feeling the tempo of our travel will be a lot different than before, which I know my husband will be happy about (I am like the Energizer Bunny when it comes to discovering a new place. I just go go go, but this time, I don't think that will be the case). Are there any tips or experiences that you would like to share? Please do so in the comments below. If you ever plan on going camping in one of Ontario's more popular provincial parks during a long weekend, be prepared to plan well in advance. 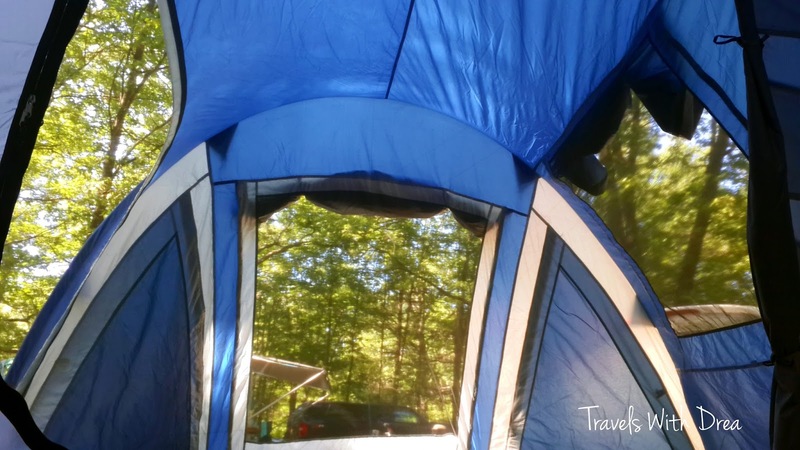 Ontario Parks' campsites typically fill up quickly, especially during long weekends. That is why I was completely shocked that I was able to get a campsite at my favourite provincial park a week before the long weekend. 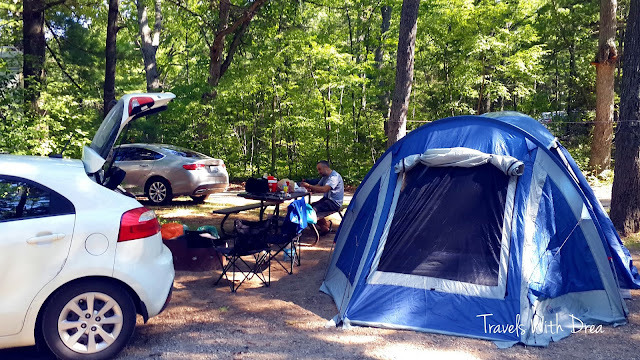 While I was trying to decide which of the remaining parks I wanted to camp at, I happened to refresh the booking page and saw that a campsite opened up at Pinery Provincial Park. Although I had never been camping at the Pinery, I had spent many summer days soaking in the sun on its beautiful sandy beaches. I knew I wouldn't be disappointed with the campsite that I booked, considering I did not have a choice (it was the only available one). 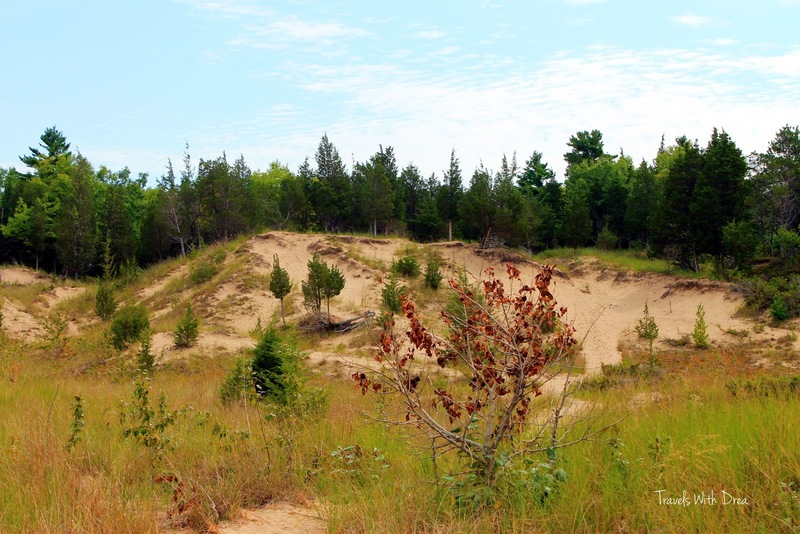 There are three different sites you can camp at: Dunes, Riverside, and Burley. Dunes and Burley campgrounds are situated on the shores of Lake Huron, while Riverside (as the name implies) are situated along the Old Ausable Channel. At first I was disappointed that we were not close to the beach, but after arriving and seeing our campsite, my feelings quickly changed. The campsite that we were at had lots of room for our very large tent (it was the first time we used it so we are happy that the site was big enough for it). It also had a power outlet which came in handy to charge our batteries. For those who are lucky enough to have an RV, there is a charging station available as well. We had to walk to where the comfort stations were to get the water, but this is pretty typical of most campsites I have been to. I should mention that the comfort stations are clean and well kept. 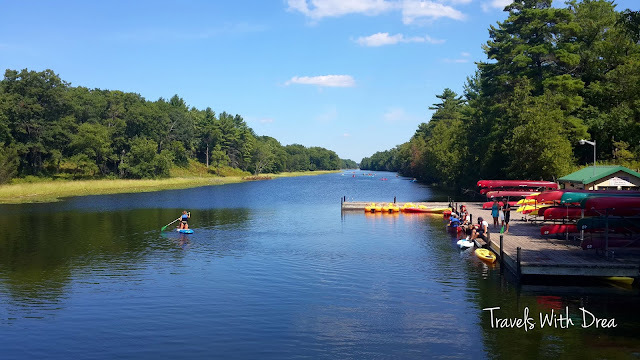 There are a variety of things to do at Pinery Provincial Park from hiking, to swimming, to canoeing, to camping, to bird watching. Pinery really has something for everyone. 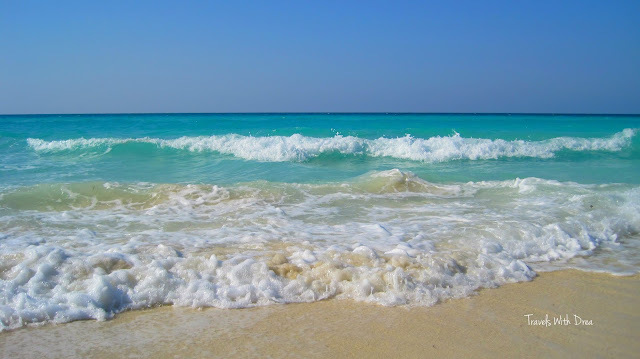 One of my two favourite things to do there is go swimming and soak in the sun on the beautiful sandy beach. There are a number of beaches to choose from. 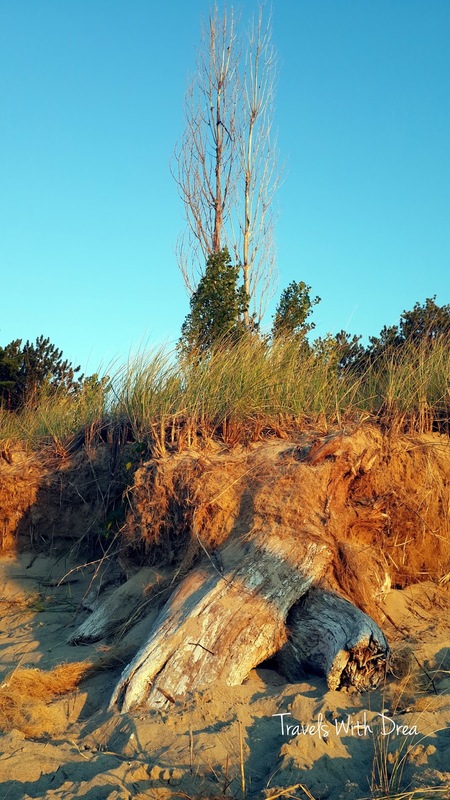 As a camper you can also get access to the beach located by the Dunes Campsite. My favourite spot would have to be at beach #6 because it is the furthest away from the parking lot so most people don't want to do the walk. But the walk is absolutely beautiful! It also happens to be one of the least crowded beaches in the park, at least I found it to be like that whenever I have gone. My pictures don't even come close to showing the beauty of the walk to beach #6. My second favourite thing to do at Pinery is watch the sunset. The sunsets over Lake Huron are among the most beautiful sunsets I have ever seen (the best are still in California). There is nothing better than to end a beautiful summer day by watching the sunset with the one you love. Radojko and I enjoyed the sunset each night that we were at the park, and we would fall in love with it over and over again. The colours that come out during the sunset are a photographer's dreams come true. Unfortunately I didn't bring my camera so all I have is these cellphone shots. 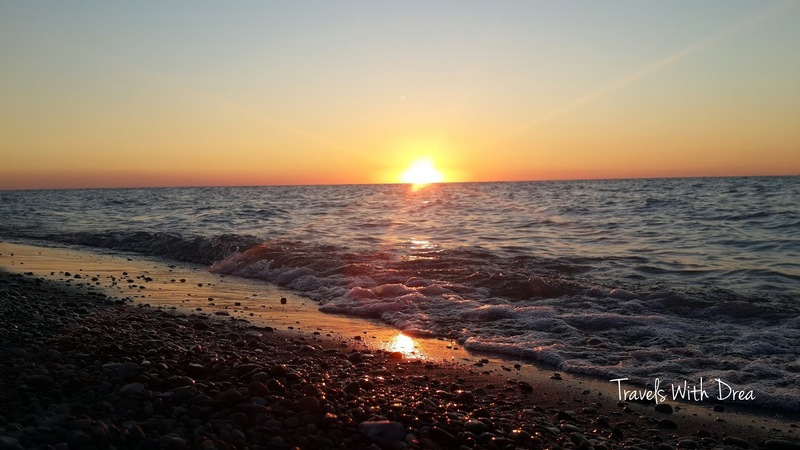 Once you are finished watching the sunset on the beach, head back to your campsite for a campfire and S'Mores! 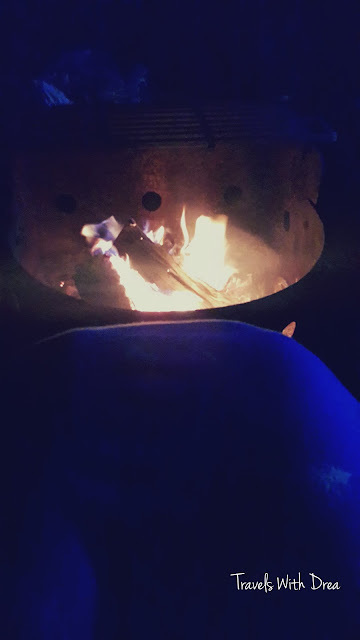 For me, that is the best way to end any camp day, don't you agree? It is up to you what you want to bring when you go camping. I prefer to pack light, yet be ready for all the weather that could happen (rain, chilly nights, hot days, etc.). Pinery Provincial Park has its own store where you can stock up on supplies you might have missed. You can also leave the camp and shop at one of the stores near by. 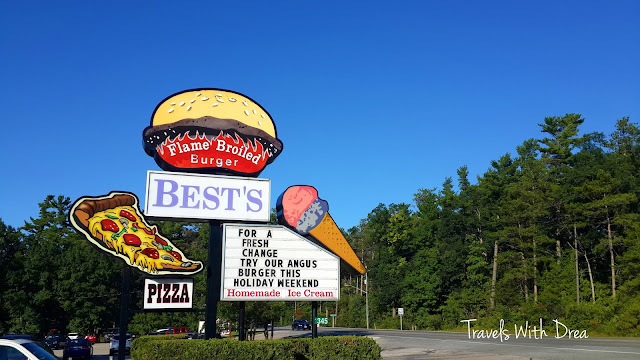 If you don't feel like cooking, I would recommend going to Best's for a delicious burger. If you just want a refreshing treat, be sure to try one of their homemade ice cream's. You will not be disappointed. 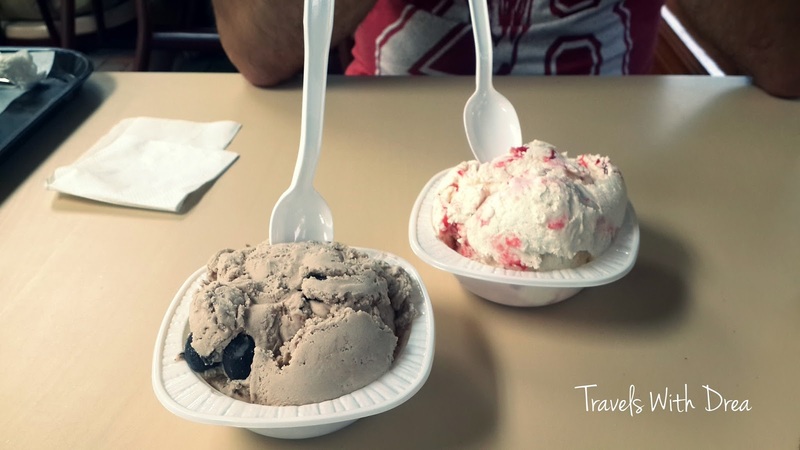 Delicious homemade ice cream from Best's! 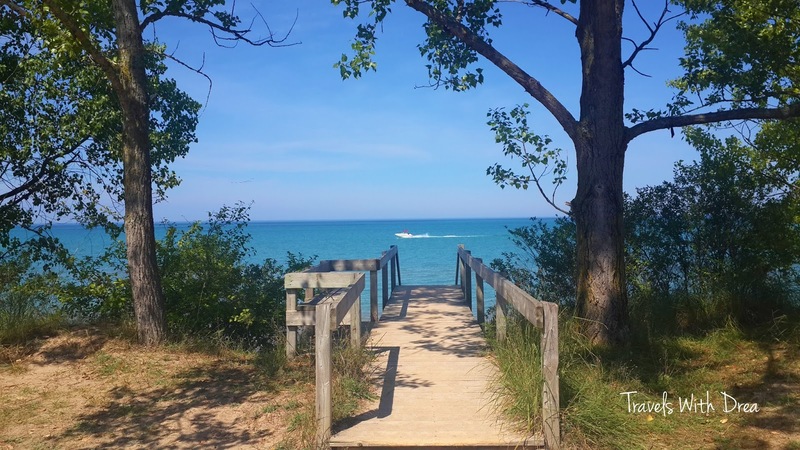 If you end up missing being in a city or town, Grand Bend is close by, but for me personally, I would take a day at Pinery over a day at Grand Bend any day! Have you been to Pinery before? Let me know your thoughts about the park in the comments below. 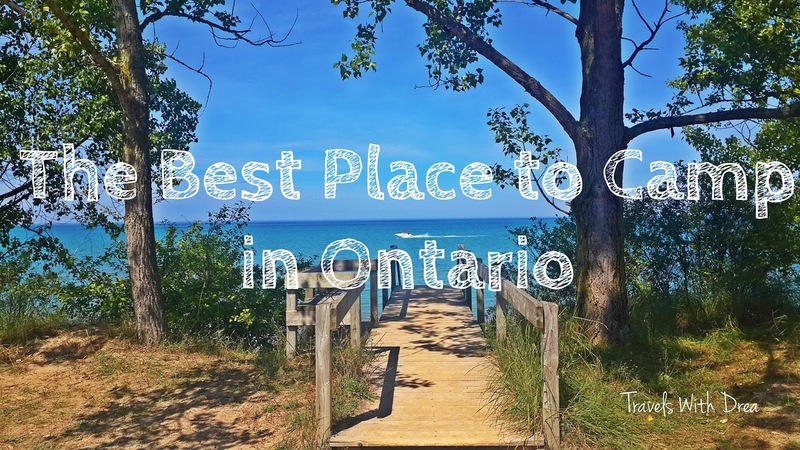 For information about going to Pinery for a day trip, take a look at my post on Pure Ontario and be sure to follow them as well. 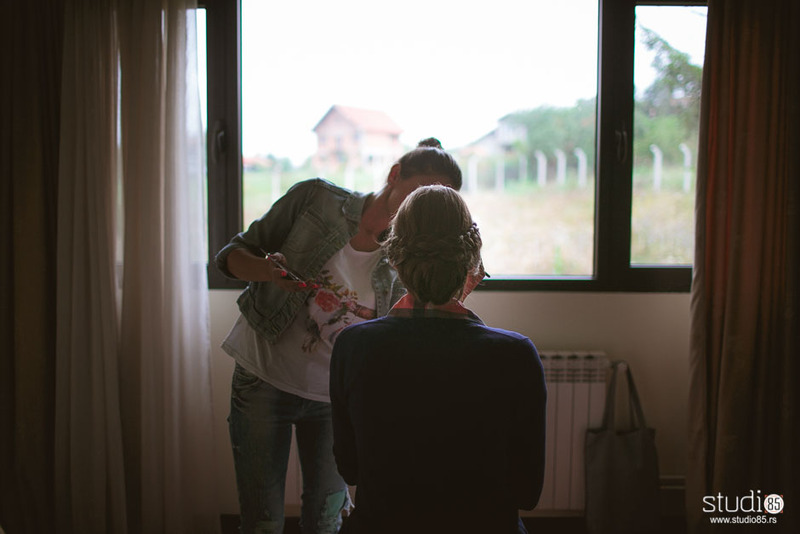 As some of you know, the last few months have been hectic for me while I was planning my wedding in Serbia all the way from Canada. Destination weddings are not an easy feat when you have to plan out every little detail on your own, so props to all of the brides (and some of the grooms) who have done the same. 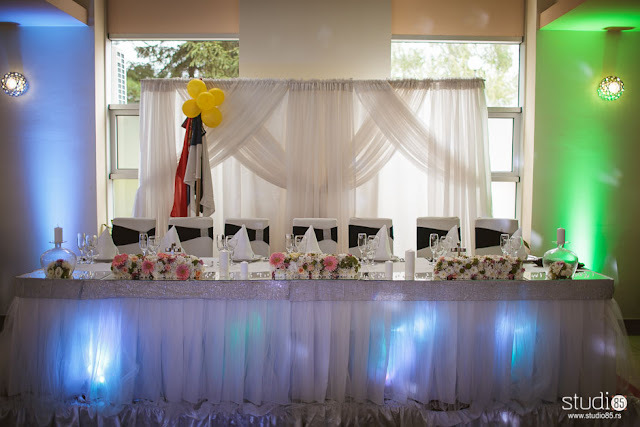 Planning a wedding is not easy by any means, but when you are thousands of kilometers away with a 6 hour time difference, it can be stressful nonetheless. 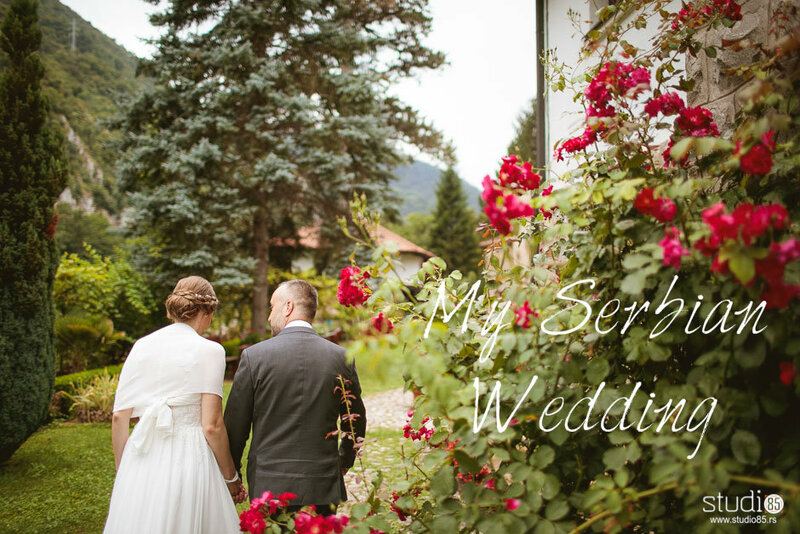 Despite all of the chaos that comes with planning a wedding abroad, I am so happy that we decided to have our wedding in Serbia. 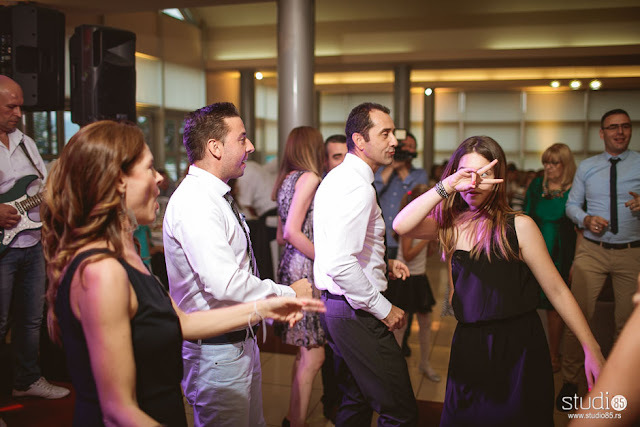 For one, majority of our family lives in either Serbia or neighbouring Bosnia, with lots more friends and family (at least mine) living in different parts of Europe. I got to spend my special day with people who would have not been able to come celebrate with us in Canada otherwise, and who are so dear to me despite being so far from each other. 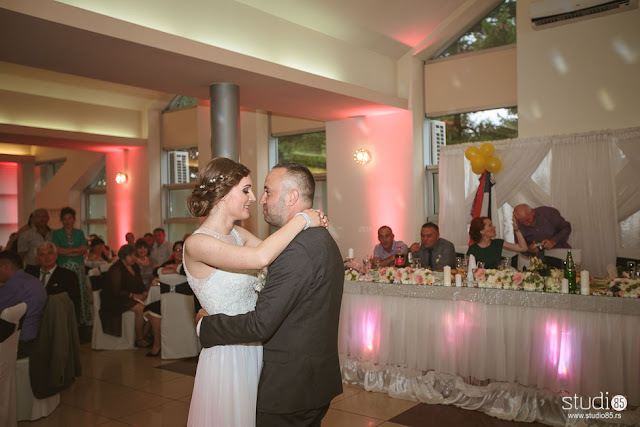 Our wedding was also (relatively) cheap to have in Serbia, which saves us money for more traveling in the future...we all know how much I love that! Getting my make up done by the talented Danka. 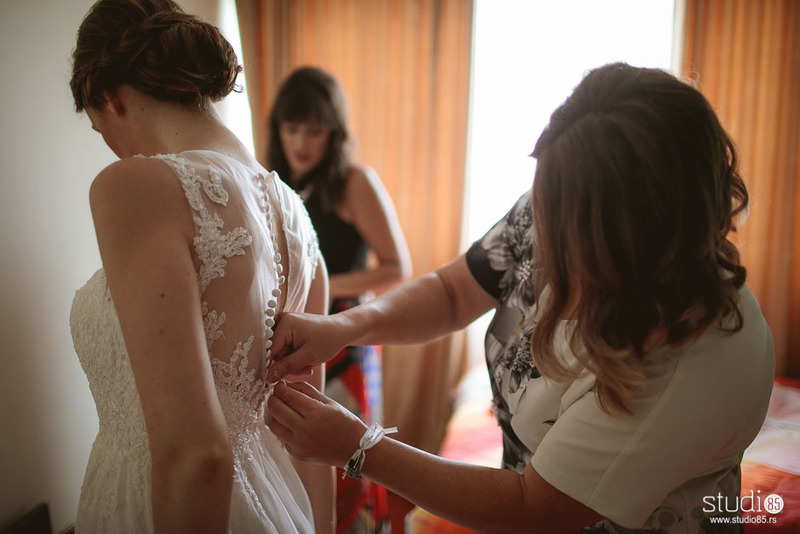 Getting my dress buttoned by my dear friend Ivana. My sister helping me put on my shoes. Once we were ready, my brother in law came to get me from the hotel room. 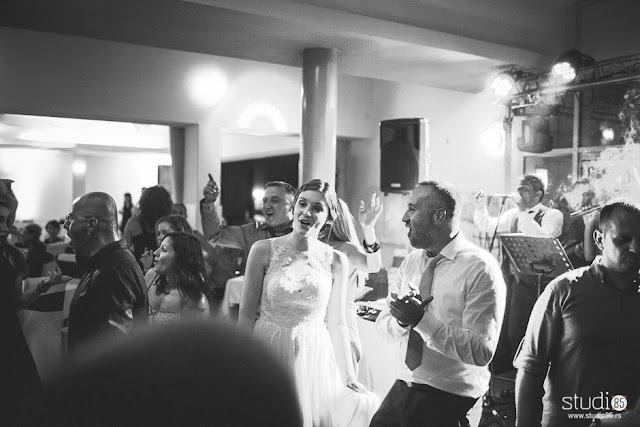 Serbian tradition is that the groom's brother, or closest male relative who is not married, comes to get the bride. It is also tradition for him to come buy the bride, which was a tradition I did not want to take part in so we skipped out on that. Here comes to bride! No, the Canadian flag was not attached to my hair haha! From the hotel, all of our 120+ guests (oh ya...this was just for the morning, we had more guests in the evening) got in their cars and followed us in their cars to the church. Kind of like a parade. In Serbian this is called svatovi. 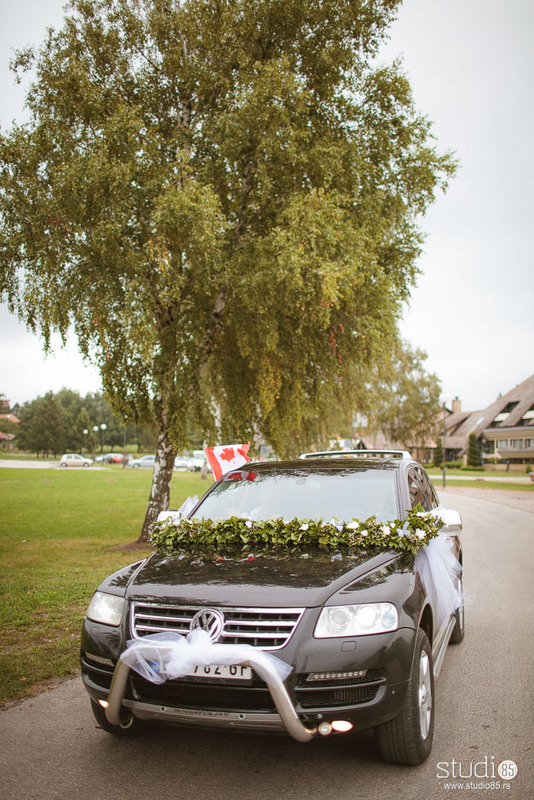 The guests follow slowly behind each other, and honk their horns. Other drivers usually stop and honk in support. 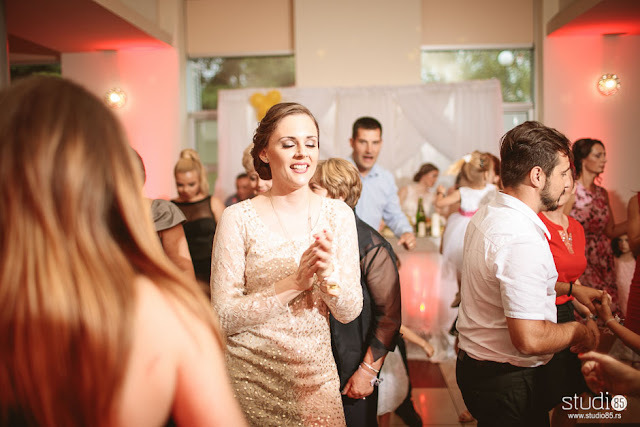 It is a lovely feeling and a great stress reducer for the pre-wedding jitters! Our ride for the day. 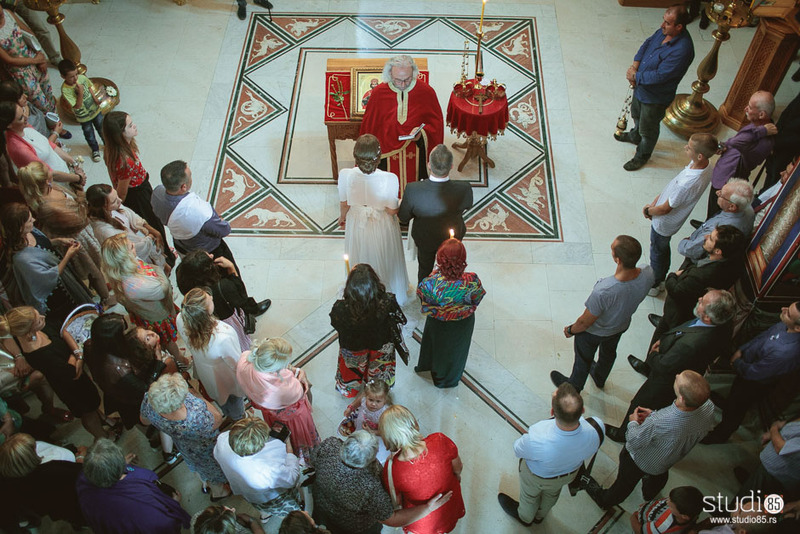 We got married in a Christian Orthodox church. The ceremony was about an hour long, but it seemed to go by quickly. During the ceremony the bride and groom take part in a couple of rituals to symbolize their union. 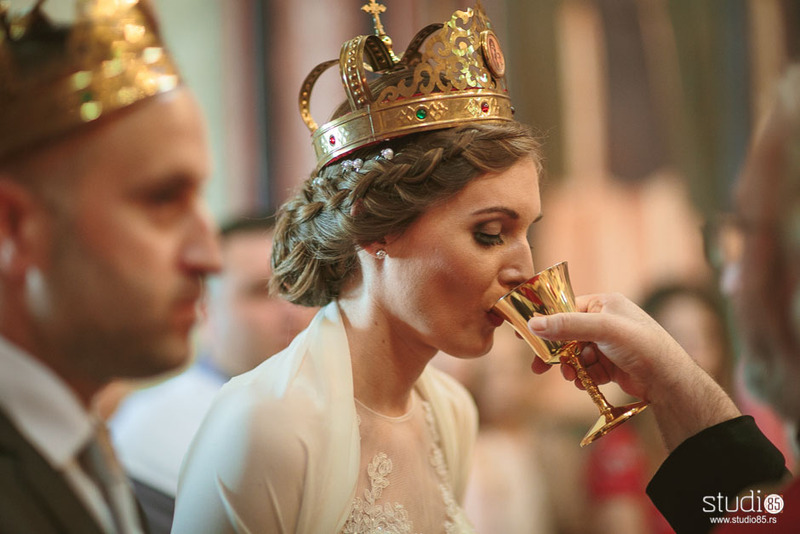 My favourite part was drinking wine from a gold goblet. I also found our church to be the perfect backdrop to our beautiful wedding. As some of you might know, we debated for a long time which church to pick (we only ended up picking one 2 months before the wedding). I am happy with our choice. Just look at those frescoes! Getting carried into the house! 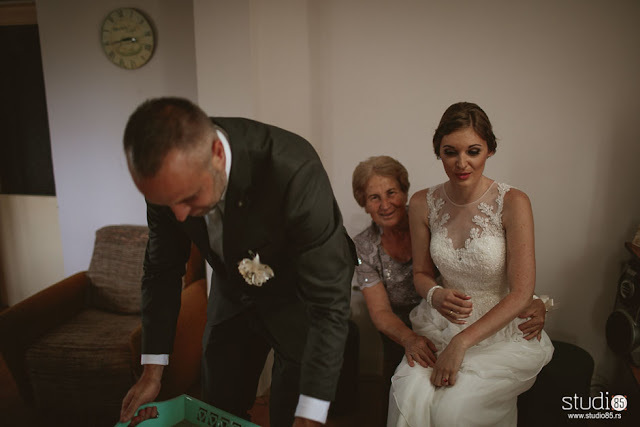 It is tradition that after the church the bride and groom return to the groom's house and for the groom to carry the bride through the front door. Oh my I was screaming so much! Radojko kept teasing me that I was heavy and I was just waiting for the moment when we were both going to fall over. Luckily, he had been working out before the wedding so we had no problems. Getting served by my husband. It is also tradition for the bride and groom to serve each other a Serbian specialty called slatko. I guess the easiest translation would be a fruit compote. This is something that is served to guests when they arrive to your house in Serbia. Oh, and I am not sure why I had to sit on my mother-in-law's lap, but it is also part of tradition. My favourite part of the day? Coming home to take pictures with our pups! 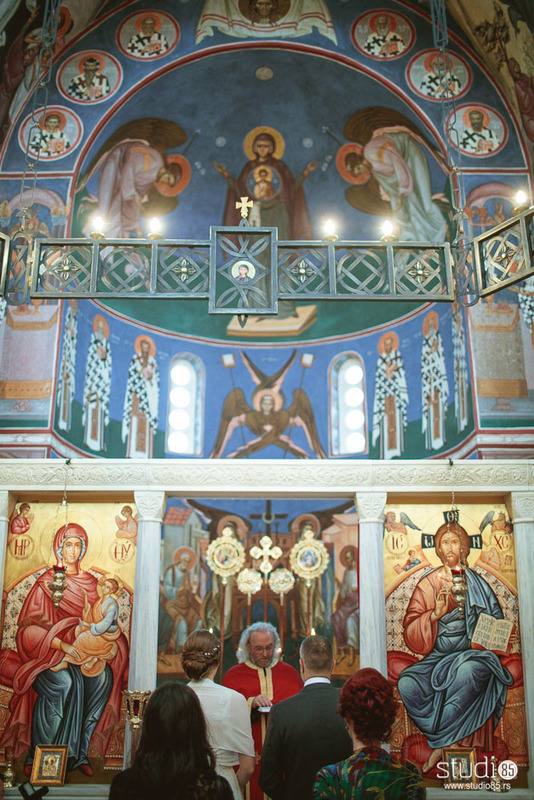 As some of you know, my first choice for our church was a monastery just outside of Cacak called Nikolje. I just love everything about this place. From the church, to the garden, to the priest and head nun. With the priest and nun that baptized me. Although we choose not to get married here because the church is very small (holds about 10-15 people) as it is from the 13th or 14th century (it is not known when it was built), I decided to get baptized here. It was a real treat to get to see the priest and head nun that baptized me on my wedding day. They are the sweetest people that I have ever met. 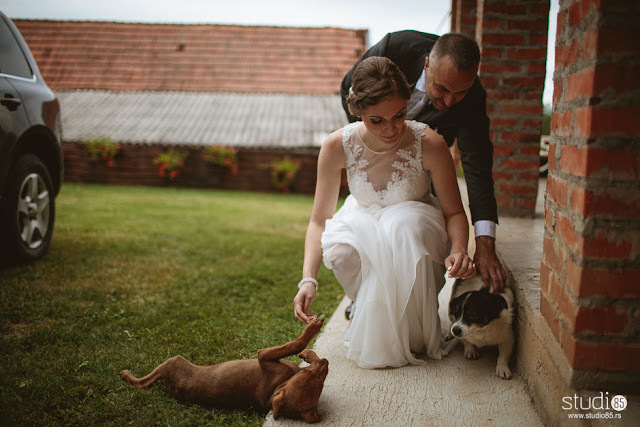 Getting bit by a puppy on my wedding day. The monastery adopted some stray pups recently. I decided to get down to pet them. The white one was a brat. He bit me (he left a nice mark) and he also tugged at my dress. The golden one was sweet and just wanted to play. At our reception we had over 270 guests, 300 if you count all the musicians, photographers, and videographer. It was great! As you can imagine, with that many guests, comes a lot of responsibilities, but luckily for us, everything went smoothly. At least we didn't hear any complaints. Let the party begin! And no that is not me in a different dress. It is also not my twin. I know that we should have had a protocol of when things would happen. 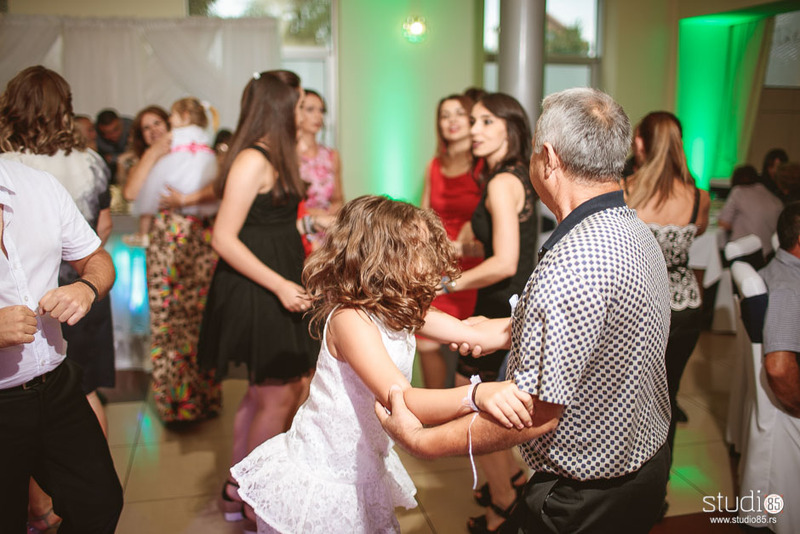 Our first dance happened a lot later than we wanted to. During the dance, Radojko and I were both super awkward. Neither one of us like being in the center of attention, so we were happy when others got up to join us! 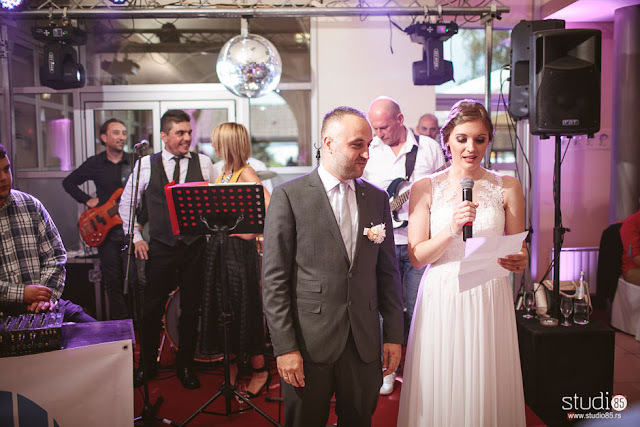 Speech time...I spoke in Serbian and English. We had guests from Canada, Australia, Czech Republic, Sweden, Hungary, Bosnia, Croatia, Montenegro, Mali, Germany, and Serbia. 4 continents! What an honour! 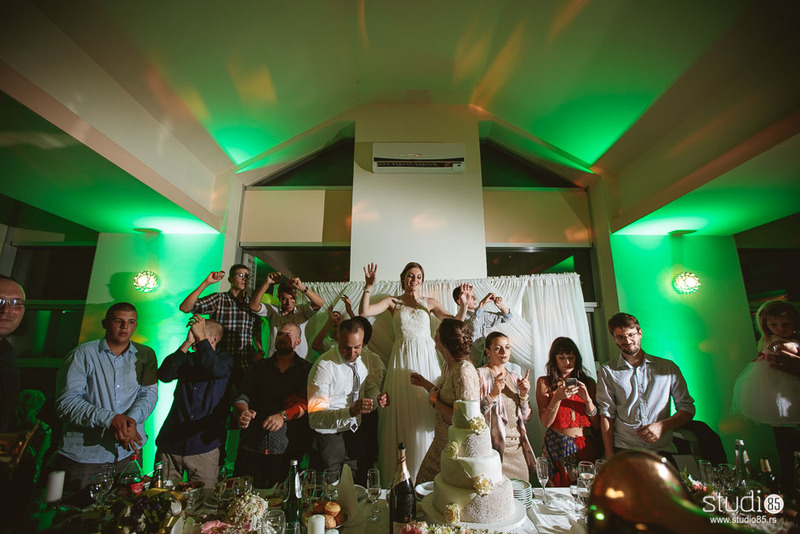 So the unthinkable happened on our wedding day. 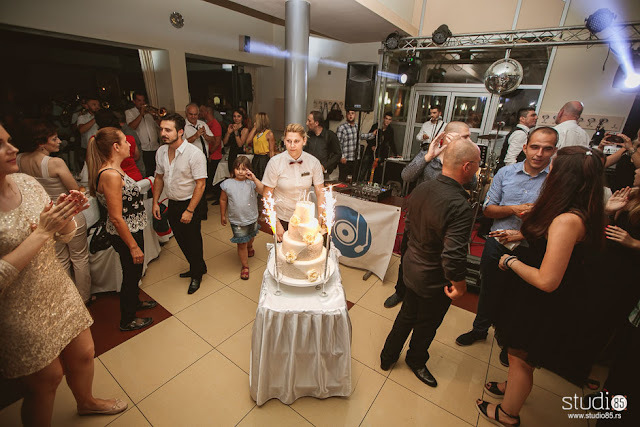 We got the wrong wedding cake! That is right! Take a look at the initials. They are not A&R, but M&C. I was in absolute shock! The place where we ordered it from sent us the wrong cake. But guess who got our cake? The bridal party that we ran into on the way to the church! 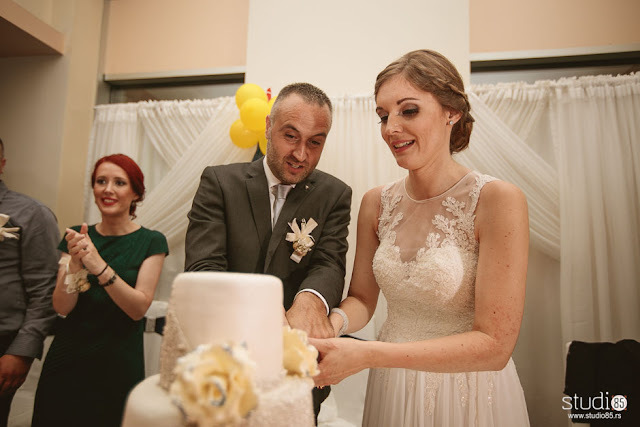 I ended up connecting with the bride on Facebook so I was able to see pictures of my wedding cake. Despite getting the wrong cake, this was still my favourite part of the whole night. The brass band that played was simply amazing! It was loud. It was wild. It was a lot of fun! Happiness is being surrounded by those you love! 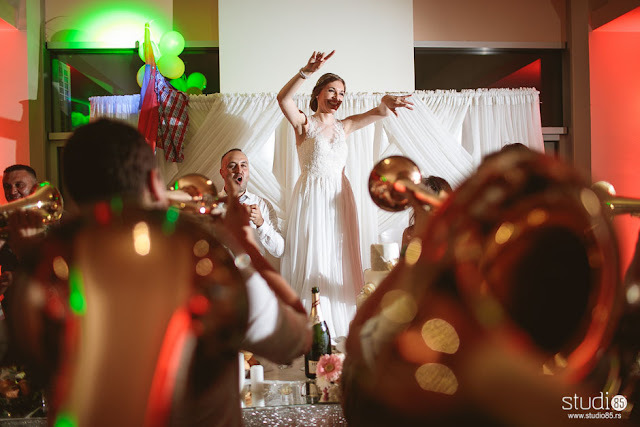 It is true what they say, your wedding day is the greatest day of your life. As I finish this post I have tears of joy for having had such a beautiful day. Despite some hurdles along the way, I would not change a single thing about that day. For future brides and grooms, embrace every moment of it. Your wedding day will flash before your eyes. It will all go by so quickly so enjoy every single minute. And don't stress over the little things. Once the day passes, all you will remember are the fun times. Cheers to all of you who took the time to read my post, to those who made the day so special, and to everyone for the well wishes. And a special thank you to our amazing photographers from Studio 85 who worked so hard to get beautiful shots and to present me with our wedding and engagement photos on my 30th birthday. 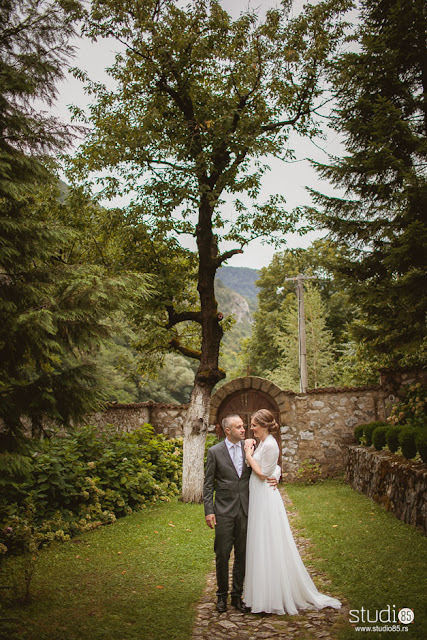 If you ever want to get married in Serbia, or want a professional photographer to take pictures, in Serbia or abroad, I highly recommend these guys. 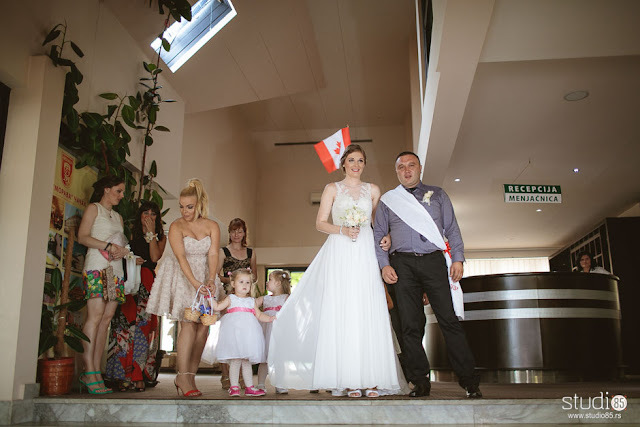 And for those of you who are interested on my dress, I got it from the amazing La Creme in St. Jacob's, Ontario. I also highly recommend them for your next outfit for a special occasion! Drea is a Canadian travel blogger who loves traveling on a shoestring budget...19 countries and counting! Dubrovnik. Is it worth all the hype? Travels With Drea. Powered by Blogger.